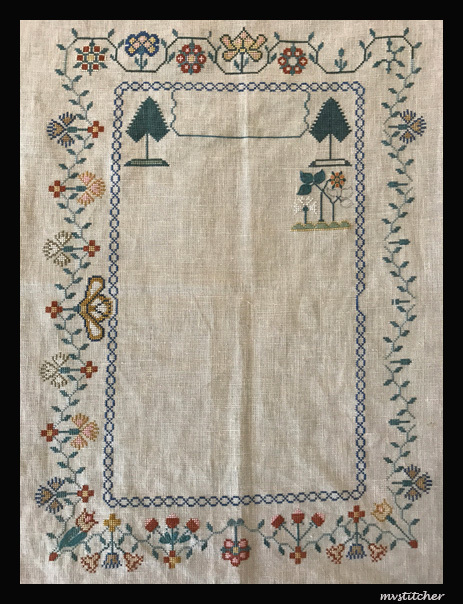 I took a break from this sampler because the willow trees wore me out. 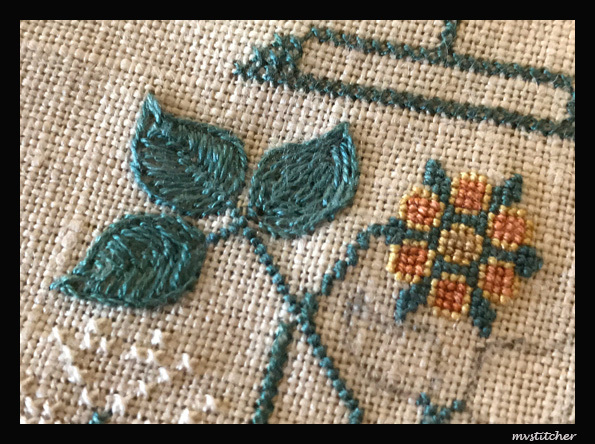 I love how they look but when I started this piece, I had no idea the hanging leaves were made of nasty little “slanted Holbein stitches”. Vikki’s super fine floss came to the rescue again. 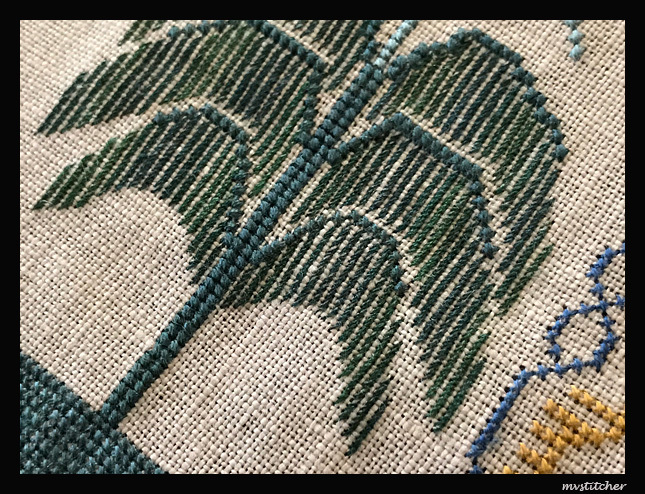 In any case, I decided that to make progress, I should stitch some of the other fun motifs along the way rather than waiting to finish the trees and getting bogged down in the process. This system has worked and now I am back to enjoying the sampler again. Here is where it stands at the moment. I have been rather sluggish with my stitching over the last year. Though I kept working on Jane, my heart was not in it and I just could not sit still long enough to focus. Moreover, it all seemed so pointless because each cross stitch project takes forever and all of my stuff and stash would become rubbish after I die anyway. 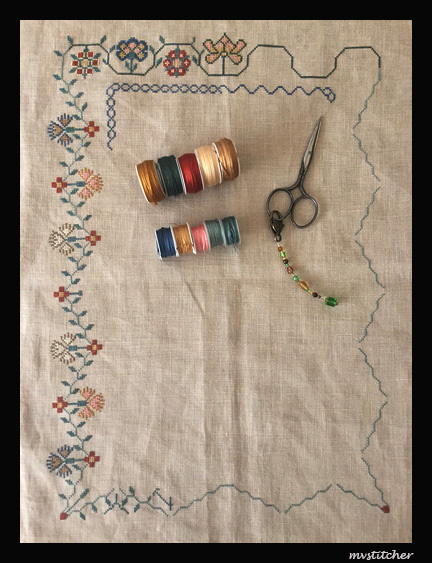 Somewhere along the way, I had forgotten to enjoy the process – to lose oneself in simply creating something beautiful with color and design, and fabric and thread, without fretting about finishing and usefulness and tangible value – all those dreadful inhibitors of the artistic impulse. Fortunately, my enthusiasm was renewed over the last two weeks when a friend took me to Stitches West – a yarn trade show held at a nearby convention center. Granted it had almost nothing to do with cross stitch but it felt very good to be among crafters and see all that fibre and color around me. And I discovered a Pat Carson’s needles, which are made by an elderly man in Japan. I like to think of them as magic needles because once I had them in my hand, I didn’t feel like putting my stitching down. Just like old times! 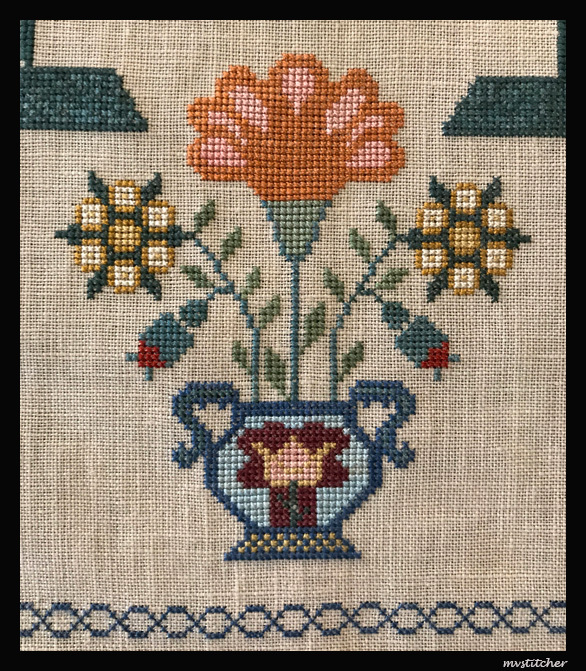 Some of the motifs in the Jane Longstreth are over one. The prospect of using regular thread over one was daunting but it was not as bad as I had expected. 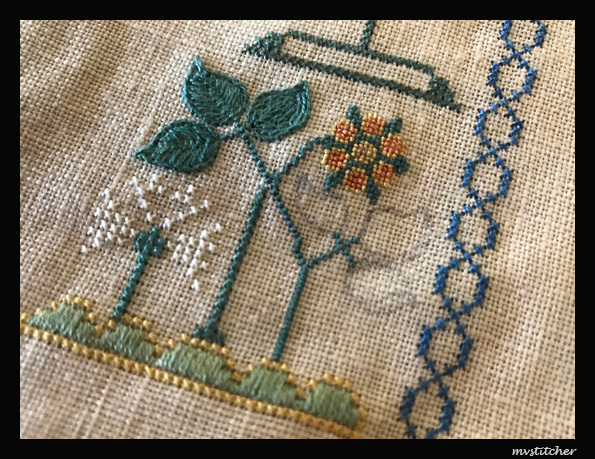 The leaves are outlined with stem stitch and supposed to be filled in with stem stitch too but I didn’t like the look (the leaf on the right). So I stitched them with the Cretan stitch using the excellent instructions here and here. I am going to try doing the rest of them without the stem-stitch outline. Here is where I stand on the sampler. Not significant progress since the last photo but I am happy to be just enjoying stitching again. I have been plodding along on Jane. I love how the colors have come together. I got started on the specialty stitches in the bottom border. Youtube tutorials on the stem stitch were very useful. 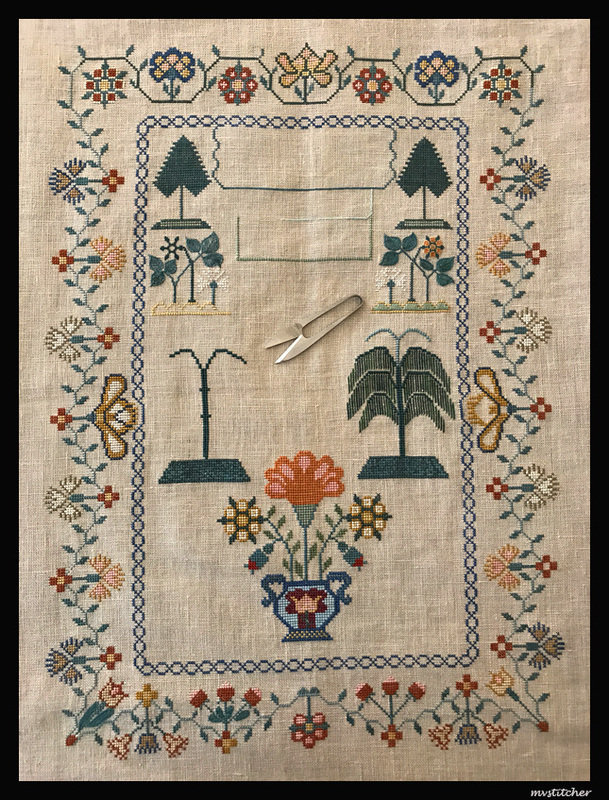 The chart instructions are to trace the outline for the leaves with a pencil using the dark diagrams provided, and then fill in with stem stitches. I did this for a couple of leaves, then got tired and just stitched using my eyes as a guide. 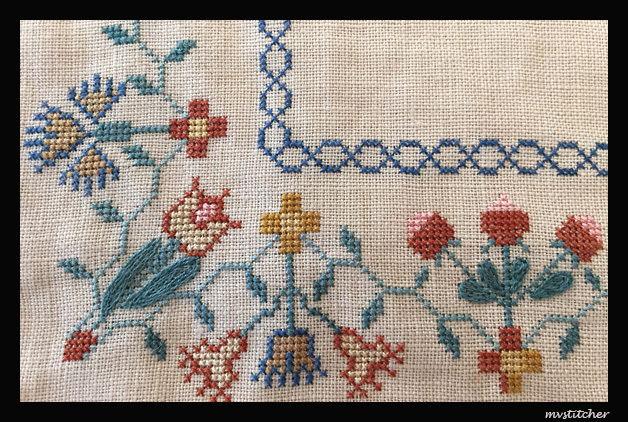 I made a mistake on the inside blue border: on the right side, I kept stitching the ovals mindlessly and forgot the straight line in the middle. I realized it only when I fell one stitch short for the last oval at the bottom-right corner. Normally, I would not have bothered to correct it, but in this case, that straight line is needed to accommodate the large flower (see the border on the left). So I frogged. Things dragged a bit after that. To perk things up, I started a new project on Friday (will post it later). I had put down my needle for a few months after a death in the family. For a while it didn’t feel like I would ever get back to it again. 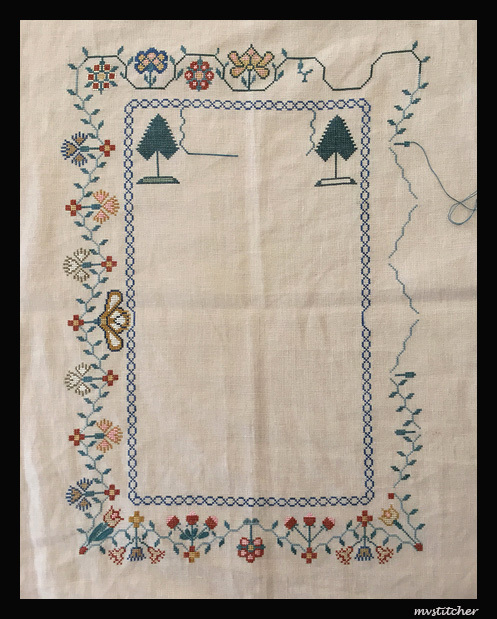 Fortuitously though, a friend gave me this sampler pattern and I found the verse so comforting that I was moved to start stitching this beautiful piece.